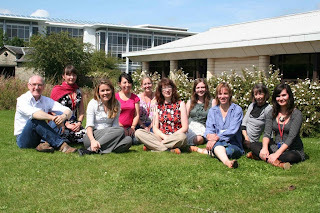 On Monday I gave a talk at an amazingly interesting workshop in Warwick. 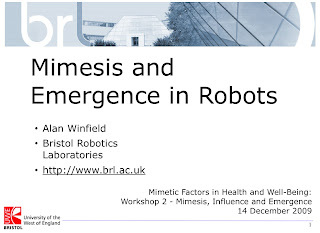 Part of a project called Mimetic Factors in Health and Well-being, the workshop brought together a very diverse range of disciplines: sociology, medicine, systems science and robotics (and I may have missed a few). Project lead, Steve Fuller, gave a great talk which reflected on both memetics (pre-Dawkins), and mimesis in advertising and PR. I found myself being introduced first to French sociologist Gabriel Tarde who, who - according to Steve Fuller - first articulated the pivotal role of imitation in society. Then to contemporary French social and cognitive scientist, and by the looks of it all round genius, Dan Sperber. I can see that I have to add Sperber to my reading list! Can I have a robot for Christmas? I was delighted to be asked to give the annual Christmas lecture to the Nottingham Medico Chirurgical society last night, in the medical school of the famous Queens Medical Centre, Nottingham. Founded in 1828 Nottingham Med-Chi, as they like to call themselves, is one of the oldest such societies in the UK. It was a great audience, with a healthy mix of children and very eminent medics who together kept me on my toes when it came to questions and answers. In my talk I focus on the current strong convergence of biology and robotics, but in reflecting and speaking with the medics afterwards I was struck that the next big convergence in robotics (perhaps the next wave after biology) will be with medicine. As our understanding of the human body and its astonishingly complex processes and mechanisms deepens, then - in a sense - medicine becomes more like ultra precision engineering. And as robotics moves toward artificial life, then engineering robots becomes far removed from mechanical and electrical engineering and more like bio-medical engineering. For a good example look at the BRL's Ecobot III, with all of its plumbing and bio-chemistry. Hence the convergence I predict. Postscript: the Notts Med-Chi society is very firmly in the 21st C: I discovered my Christmas lecture can be downloaded as a podcast on iTunes. I was interviewed by John Arlidge on Saturday, researching for a piece on the American Association for Artificial Intelligence meeting, earlier reported in the New Scientist with the title Smart machines: what's the worst that could happen. John's article in the Sunday Times was, in my view, a more-or-less reasonable account of what's actually a rather dull story: a group of senior researchers in AI getting together to discuss setting up ethical and design guidelines for future AI-based systems. Well good. That's what we should expect to happen and, indeed the AAAI group are probably a bit late off the mark. 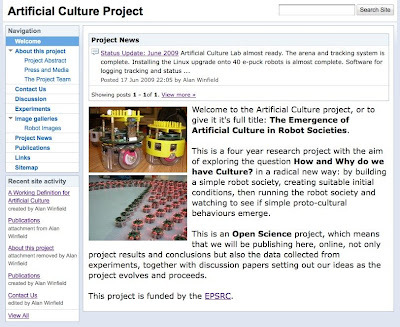 An EU initiative in Roboethics has been underway since 2004/05: here is a recent draft of the EURON Roboethics Roadmap; the South Korean government have been reported to be working on a robot ethics charter, and the venerable International Standards Organisation (ISO) have had a group working for a couple of years now on a new ISO standard for intelligent robots. 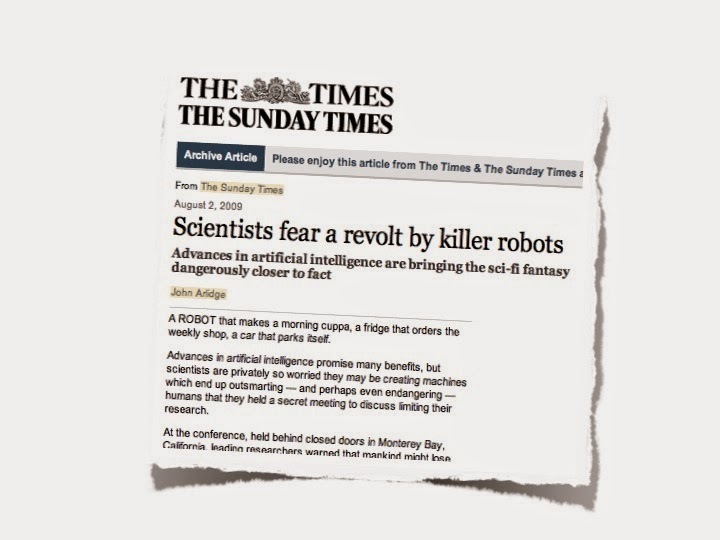 Unfortunately a sub-editor (I guess) chose to give the piece the lurid title: Scientists fear a revolt by killer robots. Sorry guys. I know it doesn't make for good headlines but we scientists do not fear a revolt by killer robots. Yes, autonomous robots will demand some new - possibly radical - approaches to safety, reliability and ethics and, yes, a good deal of effort needs to go into this, but the fact that these efforts are going on is not because of some secret fears of killer robots taking over. Just good engineering practice. There's clearly something in the air because just a couple of days ago blogs were discussing the launch of a US National Robotics Technology roadmap. Here's an interesting quote from the briefing paper "robotech represents one of the few technologies capable in the near term of building new companies and creating new jobs and in the long run of addressing issues of critical national importance". I'm here at the brilliant European Union conference Science beyond Fiction, and yesterday gave my talk in the session on Collective Robotics: adaptivity, co-evolution, robot societies. I was pretty nervous because (a) this is my first talk on the Artificial Culture project to a international audience of senior researchers and (b) the project is still in its early development stages so we don't yet have any results. However, I'm pleased to say the talk went down well and I had some great questions - followed by conversations late into the evening. One of the questions was about robot imitation: are the robots learning to imitate, or have we pre-programmed them with imitation? My answer was that we have hand-coded imitation, in other words, our robots are endowed with an imitation instinct. You have to start somewhere, I argued, and this seems a good place to start and will initially allow us to study meme-evolution in our robot society in isolation from robot adaptation. While my questioners agreed, they also suggested that the evolution of imitation would also be really interesting, and encouraged us to - in effect - turn the evolutionary clock a little further back in our robot model of the emergence of culture. Here are all of my blog posts on this project so far. Really great news. We learned today that our EPSRC bid to take Robotic Visions nationwide has been granted. Let me explain what Robotic Visions is. 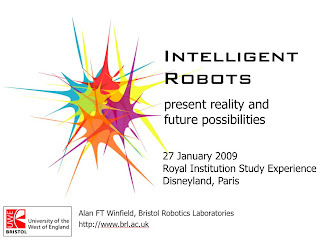 About a year and a half ago we (that is Walking with Robots) ran an event in London called the Young Person's Visions conference, co-organised with the excellent London Engineering Project and the Royal Academy of Engineering (RAE). 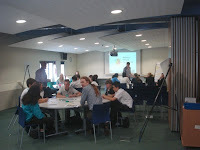 We brought about 20 young people - aged between 16-18 - to the grand setting of the RAE for 2 days and asked them to think and talk about what kind of robotics technology they would like in their future. They met with and took evidence from roboticists, in much the same way that a parliament ary select committee does, and at the end formed and agreed a set of recommendations. Those recommendations have now been published by the RAE to inform senior members of the academy and other policy-makers: click here to see that report. See my blog post on that event here: the future doesn't just happen - we must own it. The new grant will now allow us to run the same kind of event in other venues across the UK: Bristol, Newcastle, Aberystwyth, Glasgow and Oxford. Just returned from the excellent 2nd EmergeNet meeting, in Glasgow. EmergeNet is an EPSRC funded network of projects and people linked by an interest in emergence. As the Wikipedia article states, the phenomenon of emergence has been known about for a long time, but it still defies a proper scientific definition. In other words a definition that allows you to look at some complex phenomena and say yes, this is true emergence, but that isn't, and to measure the strength of the emergence (if indeed that is possible). The reason a rigourous definition of emergence is important is that we can now contemplate designing complex systems that exploit emergence. 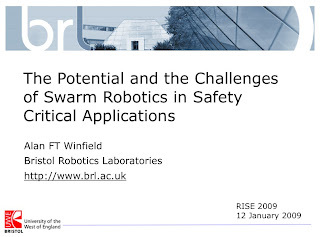 A swarm robotics system is, for instance, a designed system which relies on emergence but - within the framework of complexity science - many other systems, from molecular to economic, would benefit from a deep understanding of emergence. There were some truly excellent talks at EmergeNet2 - I'll add a link here when the presentations are online. But from one of those talks here is a link to an astonishing YouTube video from EmergeNet leader Lee Cronin and his team, showing (if I understand it correctly) controlled inorganic crystalline growth of molecular tubes - which looks remarkably organic. 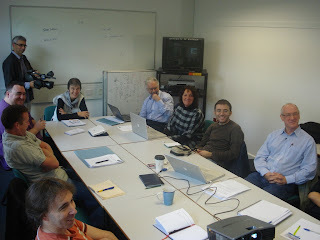 In Stuttgart, at the University, for a Symbrion project meeting. Its been a really tough meeting - which is hardly surprising given that we're one year in and - next month - have the big end-of-first-year review meeting in Prague. So a major part of the meeting has been a dress rehearsal for the review. However, spending a day and a half with a group of very smart people is always a pleasure, and there were some really interesting issues to debate. One concerns the fundamental question of how much of the Symbrion system should be designed and how much evolved (using evolutionary computing techniques). One could take a purist view and aim to evolve every aspect. My own view is more pragmatic. I think that achieving the aims of the Symbrion project is going to be so difficult that we should resort to artificial evolution only for the parts of the system that we can't design, because we don't know how. Also, I think there's a 'biological plausibility' argument for taking the pragmatic view. The Symbrion system will be both a swarm of individual robots, behaving like a swarm, and - following self-assembly - a multi-cellular organism, behaving as a single organism. Swarm and organism have, I think, radically different control paradigms; the former fully decentralised and dependent on mechanisms of emergence and self-organisation, the latter centralised and coordinated (by a central nervous system). Of course ant genes must both contain the instructions to build multi-cellular animals (the ants with CNSs and coordinated control, e.g. for walking), and their behaviours which give rise to the colony's collective swarm intelligence. However, Symbrion goes beyond anything seen in nature. 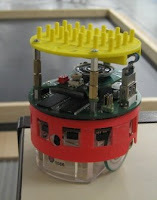 We want the Symbrion robots to sometimes behave like complicated ant-like creatures, and sometimes behave like complicated cells in a complex body (that can perform useful coordinated functions). I think if such a thing were possible to be evolved it would have been (except for the fascinating but much-simpler-than-Symbrion case of the social amoeba Dictyostelium discoideum sometimes self-assembling into multicellular structures). This is why I think engineering a single evolutionary process that can evolve both swarm intelligent control and centralised coordinated control is asking too much.